If you are planning to visit Rajasthan then do consider visiting this wildlife sanctuary in Rajasthan and another national park in and around. The varied topography of the place helps it to be a perfect place for various endangered species and attracts migratory birds at the different time to visit this place in a year. But the question is how many wildlife sanctuaries in Rajasthan? And how many national parks in Rajasthan? Let’s take a look at some of the best wildlife sanctuaries and national parks in Rajasthan with a short detail of the places. The flora and fauna of the place can be categorized by a variety of species and flowering plants. There are a number of tiger safari which helps tiger lovers get a great taste of the area. 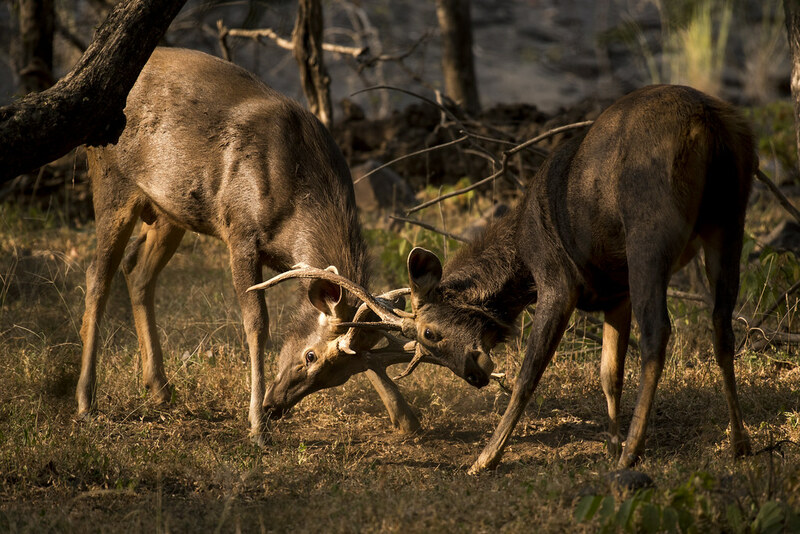 Some other common wild species include leopard, wild boar, sambar, hyena, and chital. This place can be visited in the months of winter. This is a popular tourist spot where visitors can spot a wide variety of endangered species of birds and animals. Some of these include cheetah, birds and antelopes, hyenas and sloth bears. Lion safaris are famous here. One can also try jeep safari or horse safari to implore the area. The best time to visit this place is from October to march. The most attractive feature in this area is the rocks which are all igneous in nature. There are bamboo forests and a variety of wildlife and bird species that can be spotted in the area. Some common animals include foxes, langurs, jungle cats, sambhars, pangolin bears and Indian hares. The best time to visit the place from April to June. The best wildlife safari option here is trekking. This place is famous for species such as gharials and the red-crowned roof turtle and other river dolphins. The river is a home to animals such as crocodiles, turtle, cats, and mongoose. Other attractions include freshwater dolphins. The other activities here include the hiring of boats while enjoying photographing the wildlife. The best time to visit here in September to June along with boat safari. This park is a widely known one and is famous for the animals and birds present here. Some include the desert fox, Bengal fox, antelope, and others. Sand dunes are common here. Birds like bee-eaters, partridges, and larks are some of the common ones here. One can also view some migratory birds during winter. The best time to visit this place is during the winter. This national park comprises of a lot of vegetation such as deciduous forests and grasses. The attractive feature of this tiger reserve is royal Bengal tigers. Some of the major wild animals here are Hanuman langurs, hares, chinkara, jungle cats, and leopards. There are also a number of bird species such as an eagle, woodpecker, tree pie and other similar ones. The best time to visit this place is from October to June. The common wildlife safari is a jeep. This national parks home to a large number of migratory birds and is a popular tourist place in Rajasthan. Some of the common birds found here are waterfowl, land birds, duck, and spoonbill. There are a number of mammals such as civet and fishing cat along with other kinds of flora and fauna available. Common types of safari include camel and jeep. The best time to visit this place is from October to February. This national park is famous for species and other several animals. The Sarah national park in Rajasthan is another popular tourist attraction which is famous for species such as deer, nilgai, cheetah, and wolves. The place has some another kind of beauty. The common type of safari includes jeep and trek. The best time to visit is October to march. The beauty of the landscape is very attractive. Though this place is mainly known for the different kinds of bird species some of which includes Indian darter, grey heron, and a little grey and black winged stilt. Some wild species include the wild bear, nilgai, deer, fox, leopard, caracal and antelopes. The best time to visit this place is from October to March and by foot or jeep. This sanctuary is well known for the wonderful view of the landscape and river. Among other attractions, the bird watching tours are quite common. Jeep safaris are conducted usually during the day which helps to have a closer look at the place. The best time to visit the place is from September to march. Some of the common animals found here include sambar, wolves, sloths, tigers, bears and other similar kinds. This is a famous place for tigers and has a wide range of flora and fauna in the place. Some of the major animals or birds here include deer, desert fox, rabbit, wildcat, mongoose, and smokey. The best time to visit this place is from October to February. This type of wildlife safari is by jeep. This is a famous wildlife sanctuary which is famous for species such as solar, bar, baboon, mango and dhow and parakeets. The best time to visit this park is from September to may. Jeep and trekking is a common kind of safari here. The park is well known for tigers, panthers and wild boars. Munundara tiger reserve in Rajasthan is an exotic location which has a thick population of tigers. The best time to visit the place is from January to March. The best option for wildlife safari is by jeep. The place is not old famous for the wildlife but also for the greenery and natural climate. This is another sanctuary which is famous around Rajasthan. It is well known for the natural life and various creatures such as geese ducks and swans. The best time to visit this place is from February to November. There a lot of cultural forts and other heritage sites in the nearby locations. This is another famous pace well known for species such as wild hog, chinkara, chital, and panther. The best time to visit this place is from November to April. The best time for this place is from November to April. However, the common safari is a jeep. Trees and birds such as panther, antelope, jackal and other animals are included here. The best place to visit this place is from October to march. A lot of safari rides are included here. This is a protected area and is a house of a huge number of flora and fauna such as wild fowls, nilgais, deer, antelopes, and others. This place is famous for its culture and heritage. The best time to visit this place if during the winter. However, there are a number of other options available. This sanctuary is well known for chitals, hyenas, crocodiles and other kinds of reptiles. These are well known for birds and other kinds of species around such as birds and mammals as well. The best place is during winter and spring. This is a quite unknown place in Rajasthan and is famous for the different wildlife here. The best time to visit here is from November to February. Some common animals include leopard, wild boar, sloth bear and Indian wolf. This national park is well known for different kinds of animals and other species. There are a number of a variety of flora and fauna here. This place also has some of the common animals such as sloth bear, wild boar, sambar, hyena, jackal, and fox. Other included here are trips and safaris. The best time here is during the spring or winter. Other than this there are also a number of safaris available that can help tourists visit the place.